Will Wakanda Actually Liberate the Black Diaspora? … that’s certainly the hopeful message we’re left with at the end of the epochal film Black Panther. But I think it’s worth some deeper thought. I finally watched, and thankfully loved, Black Panther this week. I was willfully swept up in all the magic and hype of the film. Was it perfect? No. Did it need to be perfect for me to enjoy it? No. As Trevor Noah put it, it was a great film — period — it was just extra special for much of the Black audience. There is much to unpack in the film, and frankly, many people far more eloquent and informed than I are doing just that. But what I couldn’t resist, was the opportunity to think out loud about the possibilities for Black liberation both imagined and missed through the film. As a person of Ethiopian descent, born and raised in North America, I was touched and inspired by the way that the film connected the histories and struggles of Black people both on the Continent and throughout the world. Equally important is the way that we can see the complexities and cleavages within these communities, which is most poignantly explored through the storyline of Erik Kilmonger (everyone’s favourite anti-villain). A version of this piece was first published on the Wellesley Institute blog on November 7, 2017, and can be accessed here. Thinking about graduate school? In the midst of preparing applications? Trying to decide between programs? With all the options and opinions out there, it can get very confusing and overwhelming. With enough time, research, and reflection you can ensure you are making a thoughtful and informed decision. Use the self-assessment tool below to help you think through your motivations, personal goals, and career trajectory. *Many thanks to Othniel Litchmore and Young Diplomats for the discussions that helped me in developing this tool. A version of this piece was first published on the International Migration Institute blog on April 7, 2017, and can be accessed here. In 2009, I travelled to Ethiopia with a group of nine other young people of Ethiopian descent from across North America. We were part of a loose collective of interdisciplinary artists and community activists that came together through a series of ad hoc online exchanges over the course of several years. The idea was simple and very exciting – what if we all came together in Ethiopia and participated in the large cultural festival that was scheduled to take place in the south of the country? It would be an opportunity for cultural exchange, creative collaboration, and transnational community building. The initial group on the email chain was quite large, however eventually ten of us committed to making the trip and started our respective fundraising campaigns to finance our travel expenses. As our departure date approached, we received word that the festival in Ethiopia had been cancelled under the orders of the Ethiopian Government. The political climate in Ethiopia was very tense at the time due to upcoming elections, and any sort of large gathering was looked upon with suspicion as a legacy of the protests that followed the highly contested 2005 elections. After a series of thoughtful discussions, we decided we would still make the trip to southern Ethiopia and find other ways to make the experience meaningful and impactful. We met up in Addis Ababa, and spent some time connecting with local artists and community organisers in the city. While there were domestic flights available to our final destination in the south of the country, we decided that we wanted to see and experience the countryside, opting instead to take what was then a twelve-hour drive. It was a beautiful and enjoyable ride, which we spent sharing stories, getting to know each other, and meeting locals along the way. As one of the photographers in the group, I also spent much of my time taking pictures from the window and documenting the trip as we went. Over the next week, we travelled through the region, meeting with local community organisers, and learning as much as we could about the people and cultures of the south. As we reflected on our experiences, we began to ask ourselves whether we should make more of an effort to give back as much as we were receiving from the communities we were visiting. After some discussion and consultation, we decided to pool our money to buy uniforms and school supplies for children in an under-resourced school in one of the towns. We travelled to the school to meet the students and presented the donation to the principal. The gifts were very much appreciated, and it felt good to have the ability to contribute despite, as young people, our own limited financial resources. Later that day, a debate emerged amongst our group about whether we should try to support the school on an ongoing basis after we returned to our respective hometowns across North America. A few people felt we had a moral obligation to do so, however there was strong resistance to the idea of making a commitment we might/would not be able to sustain, and some of the group questioned whether we were best placed to engage in such efforts at all, given how far removed we were from the community. Most of us were either born or primarily raised in North America, and we had a genuine interest in fostering a deeper relationship with Ethiopia as the country of our parents’ origin. However, what lingered for me from this discussion was a collective uncertainty about the terms and conditions of this relationship, and whether it was acceptable to explore and encounter the country without also giving something back. Jyotsana Saha and I were pleased to contribute a chapter in this wonderful book. Our portion is entitled “Points of Origin: A Visual and Narrative Journey”, and includes a collection of images and poems that explore diasporic identity. 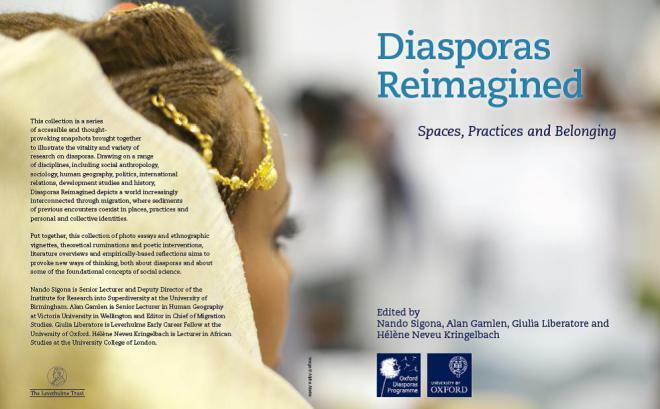 Diasporas Reimagined is an edited collection designed to showcase the breadth as well as cohesion of research on diasporas linked to the Leverhulme-funded Oxford Diasporas Programme. Featuring contributions from 45 authors, this collection is free to download as a PDF, either as a complete collection or as individual essays. Hard copies will so be available. Drawing on a range of disciplines, including social anthropology, sociology, human geography, politics, international relations, development studies and history, Diasporas Reimagined depicts a world increasingly interconnected through migration, where sediments of previous encounters coexist in places, practices and personal and collective identities. Put together,it aims to provoke new ways of thinking, both about diasporas and about some of the foundational concepts of social science. The editorial team which includes Alan Gamlen (Victoria University, NZ), Giulia Liberatore (University of Oxford), Hélène Neveu Kringelbach (UCL) and me (University of Birmingham) started as institutionally Oxford-based and is now scattered around.